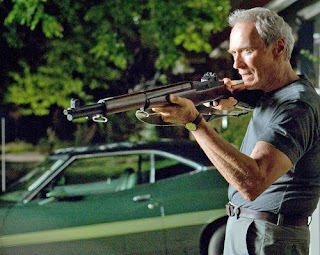 What will we do if Clint Eastwood ever stops acting? For one, nobody else could have ever played the racist and surly Korean War vet Walt Kowalski in Gran Torino. They just wouldn't be scary enough. Although I often forget about his talent these days (he hadn't acted in anything since 2004's Million Dollar Baby until this 2008 movie), Eastwood was my favorite actor when I was a kid. And he basically revises his Dirty Harry character here. Only this time, instead of blowing away crooks in San Francisco, he's citizen-patrolling the deserted mean streets of Detroit. The genius thing about this movie is that you don't have to be a fan of action-oriented Dirty Harry movies. This is Dirty Harry for your grandmother. I imagine there must be real people like Kowalski in the world (and they're probably mostly retired from the Ford plant in Detroit! ), but I sure wouldn't want to meet them in any dark alleys.